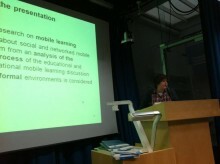 On Monday, 21 November 2011 I gave a presentation at the SoMobNet Roundtable, IoE London, about social and networked learning from the perspective of the mobile learning discussion. Title of the presentation was “Mobile Learning – Potential and controversies embodied in a young scientific field and arising consequences for future research and practice with view to social, networked and (informal) learning”. The slides are available here via the Cloudworks page of the SoMobNet Roundtable, the extended version of the abstract can be found below as well.